Are you or a loved one at risk of suffering from injuries due to falls? Many people have a high probability of suffering a major or minor injury when they are unable to retain their balance. Because of prior critical medical conditions, some are fragile enough to experience intense discomfort from even short falls. What is the solution for preventing fall injuries? Reducing the risk of your parents or grandparents from falling and hurting themselves is a daunting task. It is not possible to keep an eye on them all the time and some seniors require special assistance due to their fragile health. Even fulltime caregivers are unable to be adjacent to someone who is at risk of a fall injury 24/7. But the one thing you can do, to make sure that you or your loved ones are protected from the effects of a dangerous fall, is to devise a suitable course of action! This course of action should have two steps. First – prevent falls from occuring, and secondly, using injury minimizing products to reduce injuries. See your medical practitioner: Seek an appointment with your doctor, and be open with him about all the different medications you are taking, both prescribed and over the counter. Your doctor might instruct you to stop taking some medications, which could have side effects that affect your balance and might cause you to fall. Exercise: Instead of a vigorous workout session, opt for a gentle physical activity, which would increase your strength, flexibility and balance, thus reducing the risk of a fall. Chose the right footwear: Your footwear is of critical importance if you want to avoid any injuries due to falls. Choose sensible comfortable shoes, with no floppy slippers or high heels in your closet. Remove clutter and ensure proper lighting: Make sure that the house floor is uncluttered with no newspapers, plant stands or unnecessary rugs presenting you with an obstacle course. Use non slip mats within the bathrooms and ensure proper lighting at staircases, corridors and in the other rooms of your house, to avoid any falling accidents. Non slip socks and non skid socks help avoid any falls that result from slipping on the floors of your home. 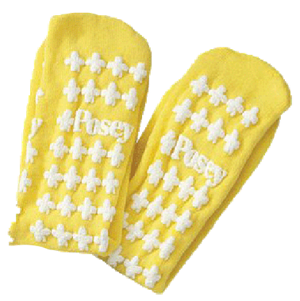 Special gripping treads are position on the soles of non-skid socks that prevent slipping. Fall management slippers are also available, which help you to maintain balance. Walking canes are also very useful to help maintain balance and to support weakened joints and muscles. While the above tips will reduce your chances of suffering a fall, there are certain products available which safeguard against a major injury, resulting from a fall. These products are often categorized as " Fall Protection Products". A great product that helps avoid fall injuries are hipster briefs. These products help buffer any fall to the hip with the use of foam inserts. Hipsters help to protect old injuries and safeguard against suffering from a new one. Floor cushions and cushioned bath mats are another good option, with super poles and motion sensor lights, helping you complete your product arsenal to prevent any falls in the future! Padded floor cushions placed beside beds and bathrooms can also prevent or reduce injuries that result from a fall. These strategically placed cushions are position where falls are most likely to take place. The extra padding can be just enough of cushion to soften the fall to prevent a serious injury. 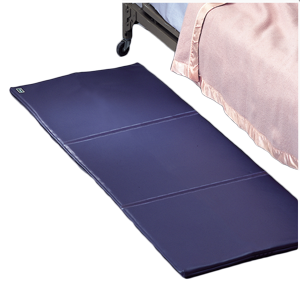 Many of these cushioned mats also help to prevent slipping. By following the above tips and using the products to avoid any falls you can easily safeguard yourself and anyone else against a probable fall.